A very bold, fearless, and courageous breed, the Tosa Inu is quick to learn and obey his master. Affectionate, and friendly, this breed can be somewhat wary of strangers but will warm up if given the opportunity. Does well with children, but should be supervised due to his size. Given the proper training, a firm hand, and control, the Tosa Inu can make a great household pet. Does not do well with other pets unless raised with them from puppyhood. Very self aware, brave, and intelligent, the Tosa Inu is said to be somewhat of an oaf. His endearing nature makes people instantly fall in love, but this breed is not for the inexperienced owner due to his sheer size. 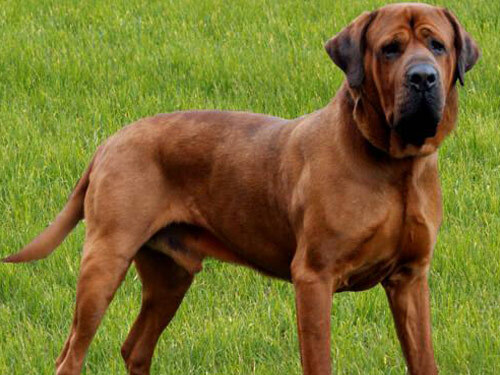 Calm, gentle and collected, the Tosa Inu is loyal to his owner and family. This breed makes a good watch or guard dog given the right training and proper control. The Tosa Inu can be easily trained and is rather social. Unless raised around other pets, the Tosa Inu should be the only companion in a household. A sensitive yet powerful breed, he is quick to obey and learn. Proper control is necessary if both breed and owner are to be happy. Fairly easy to groom, the Tosa Inu is a light shedder. An occasional brushing should be sufficient for this shorthaired breed. Muzzle area should be cleaned as necessary as this breed does tend to drool extensively. Only bathing when necessary. The Tosa, short for Tosa Inu, has a short, rather harsh and dense coat. Should be tight, and straight. This coat should be somewhat weather resistant as it is tight, short, and close to body of dog. Coat should never be silky, but coarse to the touch. This very intelligent dog is eager to learn and does remarkably well in obedience and working sports. Due to the size of the Tosa Inu, it is only recommended for experienced owners, as this dog requires a lot of control. Obedience classes are not required, but should be looked into at an early stage to avoid any future difficulties. A large yard is best for this large and fun loving breed. Given the proper exercise, this dog will do okay in apartment life but should have exercise area available. The Tosa Inu makes a great jogging or running companion and does well on long walks.